This act was a revolution but only one step in a continuous process; civil rights is an ongoing conversation. Today debates continue about gender, sexual orientation, relationship status, and so many other issues. If you work in HR, or are looking to hire, awareness is your first step towards success. These acts cover several different kinds of protected classes but have not ended the controversy. Wage inequality for women and minorities and discriminatory hiring based on sexual orientation are only a few of the issues still being debated today. Opinions, regulations, and laws regarding these issues differ in each state. The landscape of civil rights is ever changing as regulations evolve to meet new challenges in civil rights. Your job is to be aware of these changes and adapt accordingly. What exactly does this mean for HR? Civil rights issues are topics of controversy that directly affect your HR department. Because the government can’t police everyone, much of the responsibility for equality falls on companies and HR departments. For this reason your company needs to be aware of recruiting a diverse workforce, not just to keep with regulations, but also because of the different skill sets and perspectives employing a diverse population presents you. Companies that hire diversely are opening themselves up to talent they may miss out on otherwise. The key to reaching a diverse population is instituting a diverse recruiting strategy and ensuring fair treatment in the workplace. This includes being aware of the laws and regulations in your state, focusing on hiring diversly, putting in place diversity training for management, putting in place diversity training for employees, and stressing the importance of respect to all employees. AT&T knows having a diverse workforce is critical to their success, so they specifically seek out employees who present a variety of perspectives. Focusing on diversity education may be the key to reaching that goal of equality that was started with the passing of the Civil Rights Act in 1964. A simple way to do this is looking into implementing or improving your diverse hiring and culture-building strategy. 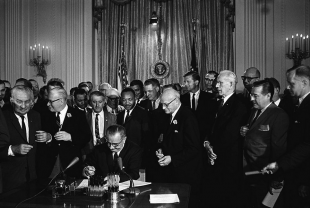 The passing of the Civil Rights Act was a predominant moment in our history, one of many such moments that have taken place since and are still to come. If you want to protect your company from legal action and ensure that you are recruiting the best talent in the market, it is vital that you are aware of the ever-changing civil rights landscape. Responsibility for diversity falls on everybody, but it starts with HR.